Pinch me. 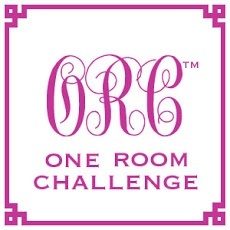 How is it already Week 4 of the ORC? Time flies when you have none. Am I right? Don't get me wrong, I thrive in the realm of crazy! We'll make it. Today my office gets an inspiration board! I've needed one forever. I dedicated a whole post to wanting one here, over a year ago. And.... it never happened, until now! To create mine, I simply took a linen fabric I liked and wrapped it over a cork board, then staple-gunned it in to place. I have to keep my DIY's simple. Remember my X-bench tutorial? You know I love my staple gun. A fun mix of fabric swatches, paint colors, quotes, and pictures that inspire me, this board is both functional and aesthetically-pleasing to me. All of those samples up are being spec'd for current projects, and I like staring at a mojito while working. The quote in the center of the board is actually a greeting card that says "I recommend vodka." The smaller quote says, "I find inspiration everywhere I look. It often comes when I think I see something and realize it's something else. It can come from a building, a bridge, an object or even a shadow." And finally, a personal favorite, "Quality is remembered long after the price is forgotten," said by Gucci. I hope you like! Happy Wednesday! 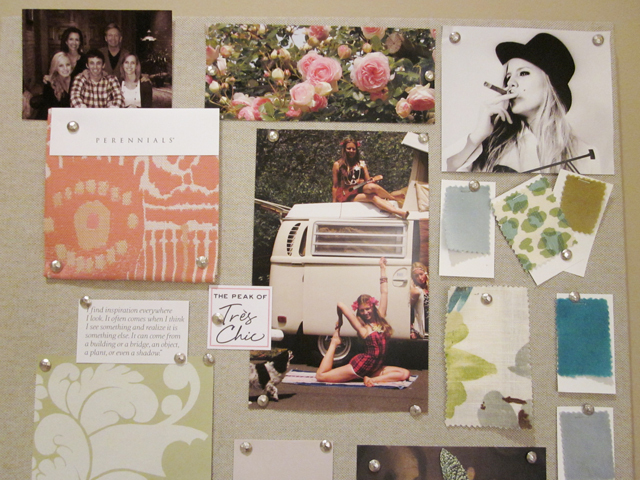 The inspiration board is great and I love how your desk styling is coming along. I am redoing my office right now and this is inspiring me. This is SOOO lovely. I adore the inspiration board. It is amazing! Love an idea board in the office, it is inspiring and gets the juices flowing, along with a Mojito! Your office is looking gorgeous, and your collection on your desk so fun! Gotta get that pencil holder, I love it. That is the best quote..."quality is remembered...." so true. Girl, can you style a space. 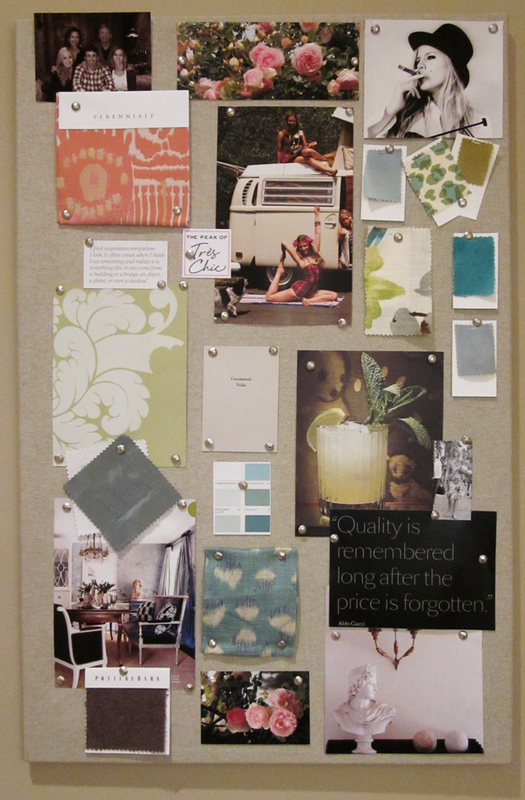 Gorgeous inspiration board, along with those fabrics on it! I'd certainly be inspired hanging out in there! Love the vodka quote :) You can never go wrong with a fab inspiration board! I love your board!! and your desk top is looking amazing! And I love the quality is remembered quote! Perfect inspiration board, I need to make one! Lookin good lady! Love the inspo board! I DO Like! Yes, your office is rock'in!! Isn't the layering on the most fun part of the process. It's looking great! you are well on your way! that little amethyst paper clip holder is darling! It's all coming together Sam. Great colors on the board. Definitely starting to see a palette take shape in the space. 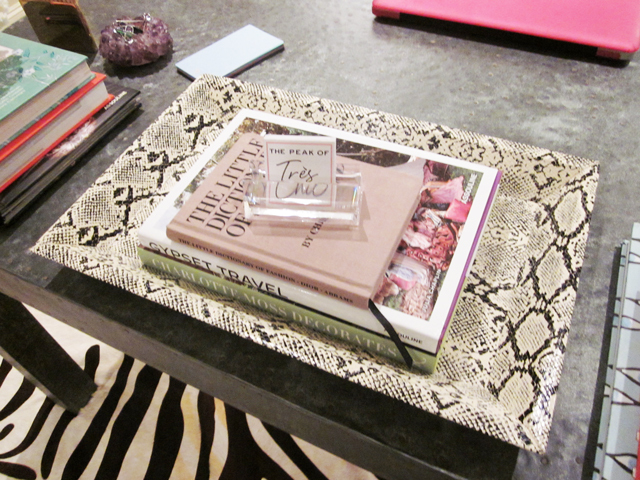 And of course you also have two of my wish list items on your desk- the brass pencil holder and snakeskin tray. Can't wait for you to pull the camera back and show how it all works together! So pretty! Love all of the images and items you chose to display! This is really pretty Sam! And I love how organized it is still. What a great and practical way to keep your client's rooms in your head! love the tray--pretty and functional! One of these days I will get around to doing and inspiration board! I just know I am going to love this office. Fabulous collection. I could easily put all of your stuff into my home and be a very happy girl! Great board! The happy mess of objects is looking awesome too! The Gucci quote is my favorite -- so so true! I'm crazy for your new desk and the styling you've done is looking really great!! love your inspiration board!! looks amazing - and love the desk accessories too. Lots of fun going on here !!! Time to change my inspiration board. Your desk is looking fabulous! A well edited selection of beautiful things. 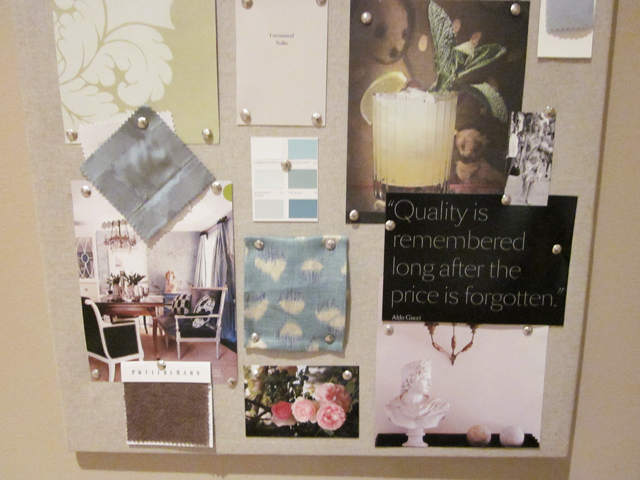 I love the simplicity of your inspiration board - might have to make one of those myself. So good! Your inspiration board is fab, and I must say I can't get my eyes off that little amethyst bowl you are using to house paper clips. Week four and onto styling is definitely a good sign! Keep up the good work. Now I am caught up on last week! I can't believe I didn't meet you at the DBC!! I had an AMAZING time. So inspired I couldn't sleep and have been up since 3am. This is looking great!